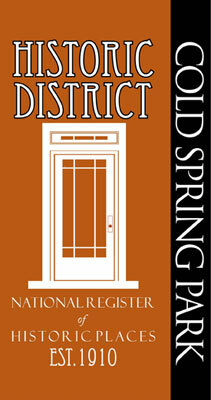 The Cold Spring Park Historic District is located north of downtown Hendersonville, Henderson County North Carolina. The historic district is bounded by N. Main Street on the north, Maple Street on the east, 9th Avenue East (originally Lynn Street) on the south, and Locust Street on the west. Cross streets include Highland Avenue, Algeria Street, and Laurel Street. The neighborhood is laid out in regular blocks, with the overall elevation dropping from Locust Avenue to Maple Street. Most houses are set back from the street on level lots with front lawns, but some houses are raised up above street level, especially those located along Locust Avenue. These are sited high up on a hill with stairs leading from the sidewalk up to the walkways to the houses. Houses are typically built close together in a steady rhythm of setback, lining both sides of the streets. Notable landscape features include fieldstone or cut stone retaining walls and flat field stones set into the hillsides. These features are seen in other Hendersonville neighborhoods, primarily Hyman Heights, located to the north across N. Main Street from the Cold Spring Park Historic District. Outside the district boundaries to the north is the National Register listed Hyman Heights/Mount Royal neighborhood (NR 2001), to the west is a city park, to the south is an industrial area, and to the east are additional historic and modern residential areas. The district, which encompasses approximately fourteen acres, incorporates within its boundaries those concentrations of houses in the Craftsman bungalow, Colonial Revival, and Ranch styles dating from ca. 1910 through 1953, all of which were built within the historically platted Cold Spring Park subdivision. The district forms an intact configuration representative of Hendersonville's residential development from the boom times of the first two decades of the twentieth century, along with significant growth which occurred in the 1940s and early 1950s. The district overall has retained a high degree of historic architectural integrity. By far, the majority of the buildings in the district are Craftsman bungalow style. The nominated district consists of thirty-seven contributing buildings and outbuildings, one contributing structure, twenty non-contributing buildings and outbuildings and six non-contributing structures. Of the non-contributing resources, the majority of these are modern outbuildings, including many free-standing metal carports. There are two vacant lots in the district. Non-contributing buildings are a mixture of buildings out of the period of significance and historic buildings with significant alterations such as porch enclosures or removal of numerous key architectural features. If a building retains its historic form and detailing, but is clad in artificial siding, it is still counted as a contributing resource. Buildings are listed in the order of north-south streets first, followed by east-west streets. The north or west sides of the street are listed first. Dating of houses is based upon 1922, 1926, 1949, and 1954 Sanborn maps used in the field, city directories, and owner questionnaires. These sources are noted with each entry. If the original owner or long-time occupant of the house is known, it is given as the name of the property. Otherwise, properties are called by the property type such as house or apartment. Unless otherwise noted, roofs throughout the district are asphalt shingle.